The fourth postcard comes from Les Espaces d’Abraxas, the illustrious housing project of Ricardo Bofill in Marne la Vallee. At the time the Dutch government incorporated the growth centres policy in the Second National Spatial Planning Policy Document (1966), the French government was forced to deal with an enormous housing shortage top-down. This is how the plan for the Villes Nouvelles derived. There are five around Paris. 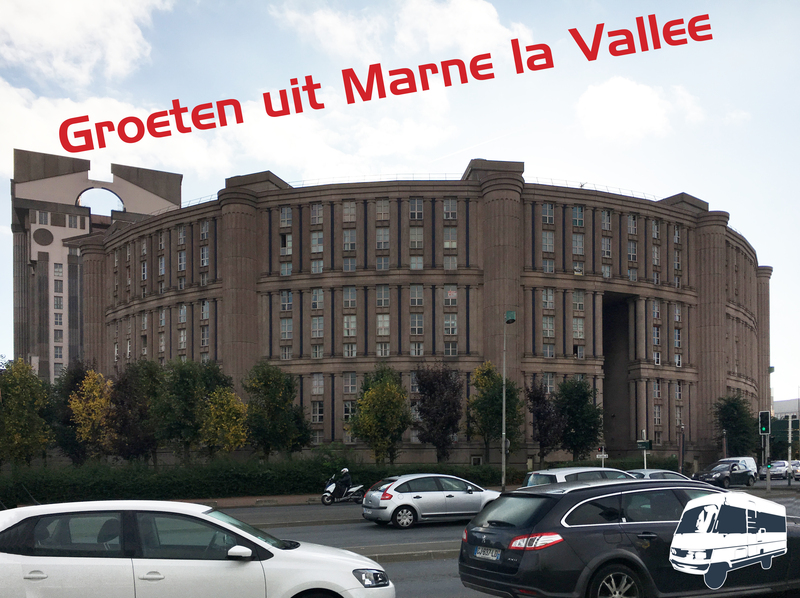 The largest is Marne la Vallée with almost 300,000 inhabitants, consisting of no less than 26 municipalities. We visit the very first part of the new city that was built at the beginning of the 80s: the quarters Monts d’Est and Pavé Neuf both located in the commune of Noisy le Grand. These two neighbourhoods are located next to the A4, which connects Marne with Paris. The distance from Noisy le Grand to the Paris city center is only 20 kilometres. On the edge of Monts d’Est is Les Espaces d’Abraxas, a megalomaniac residential complex designed by Ricardo Bofill.